In August of 1914, the airplane had barely made its tenth anniversary, and had only just become a weapon of war. The Italians had used air power (if it could be called that) in North Africa in 1911, and Louis Blériot’s famous trip across the English Channel was still a fresh memory. The Great War was a time of heroes and villains, a war where everyone knew who was fighting whom and for what cause. Both sides had their great victories, pyrrhic defeats and plenty of trench foot. While this game is designed to simulate the greatest battles over the trenches of the World War I battlefield, we should not forget that men and women died for their beliefs and for their countries. Heroes were born of this combat on both sides. At no other time in our warring history has there been such a change as the airplane. Not only did combat change forever once our soldiers were airborne, but a whole generation became enamored of this newest weapon in our military arsenal. Even into the twenty-first century, the romance and joys of those first years in the air evoke the deepest respect for these new knights, these men of the airways. 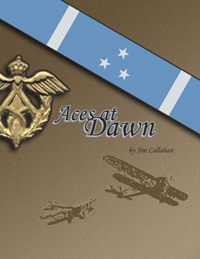 Aces at Dawn is a game of quasi-historical combat in the skies. Set at the turn of the century, the game models the man-to-man combat of the World-War I flying ace and his dreaded enemies. As with all Majestic Twelve games, Aces at Dawn is fun and easy to play, works with any line of miniatures, and encourages players to use their imagination and have fun, which is the way wargaming is supposed to be. With 36 planes at your disposal and a fully-customizable points system, you can build existing planes we haven't included and also try out designs that you think would have wreaked havoc in the skies of France. The flexibility of the system allows players to recreate the man-to-man air jousting at the turn of the twentieth century. A simple combat and maneuver system means you can dispense with complicated maneuver charts and intricately detailed plane record-keeping. What’s left on the board is just plain fun. The ZIP file includes both full-color and printer-friendly PDF versions of the rulebook.